MELBOURNE has re-signed Sam Weideman until the end of 2019, hopeful the promising tall can form a potent long-term partnership with fellow key forward Jesse Hogan. 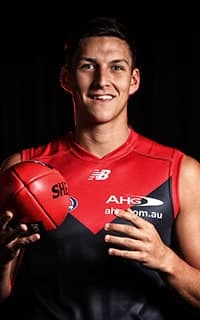 Weideman, Melbourne's first selection in the 2015 NAB AFL Draft at pick No.9 overall, was due to come out of contract at the end of this season but the Demons and the 19-year-old's manager, Ben Williams of Players Ink, agreed to a new two-year deal this week. Weideman was the second key forward taken in the 2015 draft – behind Josh Schache, who was selected by the Brisbane Lions at pick No.2 – and bounced back from an injury-plagued final junior season to have an encouraging first year with the Demons. In 2016, the Eastern Ranges product kicked 25 goals in 11 VFL games before playing three senior games late in the season, kicking two goals on debut against Hawthorn in round 20. Weideman told AFL.com.au he was "very grateful" for Melbourne's show of faith in him and was excited by what the Demons' emerging list could achieve over the next few years. Weideman said his brief taste of AFL football last year had been "a big eye-opener" as to how much bigger and stronger he needed to become to succeed as a spearhead. To that end, the 195cm forward has put on 6kg this pre-season, a weight gain which – without affecting his running capacity – has him far better placed to provide a strong target in attack in 2017. Weideman is excited by the prospect of playing alongside Hogan and Jack Watts, who both recommitted until the end of 2019 last year, but is not taking a senior spot for granted, saying he will face stiff competition from fellow Dees talls Cameron Pedersen and Liam Hulett. On the surface, Hogan, 22, and Weideman loom as the aerial targets Melbourne can build its attack around for the next decade, while Watts has the class to hurt opposition defences working further up the ground. "'Hoges' has already stamped his name in his first few years that he's played, just his aggression and his launch at the contest, it's a real joy to watch, especially playing alongside him," Weideman says. "Jack's just got great poise and his skills are unbelievable, so I'd love to get the opportunity to play alongside those two, they're both quality players and they're really good to work with. "Hopefully I can grow with them and grow with the success of the club. "We're all hoping – as all the forwards are – that we can gel together and really create something special." Melbourne football manager Josh Mahoney told AFL.com.au Weideman's development in his 16 months with the club had been pleasing, but said the forward was probably still 18 months away from having "an AFL body". "Sam is a key part of our side moving forward and key forwards are difficult to find and we know already that there are some other clubs that would be interested in having a player like Sam on their list," Mahoney said. "It was part of the club's strategy to have a forward line structure that involved a couple of key targets, with Jesse Hogan being one of them and Sam, with his progression, hopefully can become the other one. "We think that sort of structure is going to be pretty potent moving forward. So Sam is a really important signing and another sign that we're going in the right direction as a club."